WE DO OUR BEST TO KEEP OUR RIDES GOING YEAR ROUND! All rides start from the shop unless otherwise indicated. MONDAY ROAD RIDE - Starts April 22nd and leaves the shop at 6:15 PM. This is a nice, social-paced loop around the North Shore we where we average between 15-18 mph. THURSDAY NIGHT LIGHTS TRAIL RIDE - A 6:15 PM cross-country ride from the shop. We go out and have some fun on our local trail network. Sufficient lights are required to ride with us at night. For updated information, please check out our Facebook event page! Hit the Follow button and stay in the loop! The North Shore Tour de Cure is part of the Tour de Cure series of cycling events around the country that benefit the American Diabetes Association. It takes place Sunday, May 19, at the Topsfield Fairgrounds, 207 Boston St., Topsfield, Mass. Cycling routes are 12, 30, 63 and 100 miles. The 100-mile route is a Gran Fondo that features timed segments. Routes take you along charming country roads and the beautiful seacoast of the North Shore, including Cape Ann and Ipswich. Fundraising minimum is $200. There is a $250 minimum for the 100-mile Gran Fondo. There is also a 5k run/walk option. After the ride, enjoy lunch at the Topsfield Fairgrounds along with games, music and a Community Health Expo. All participants raising the minimum or more will receive a Tour de Cure T-shirt. Incentives for reaching higher fundraising levels include a Tour de Cure cycling jersey, wind vest and Tour de Cure Champion jacket. We are happy to provide mechanical support at the Ipswich stop again this year! The New England Classic is a multi-day Tour de Cure fundraising event for the American Diabetes Association that offers two-day and seven-day options starting Saturday, July 13, in Bedford, Mass. at Middlesex Community College. The 150-mile NEC 150 and 550-mile NEC 550 travel the same route for the first two days. Indoor, air-conditioned accommodations and breakfast and lunch are included with the fundraising minimum of $850 for the NEC 150 and $2,700 for the NEC 550. All New England Classic riders receive a NEC T-shirt and customized NEC Tour de Cure cycling jersey. NEC 150 riders travel the back roads of the Merrimack Valley of Massachusetts into southern New Hampshire and along the seacoast with a destination of Durham, N.H. The Day 2 route takes riders to coastal Maine past beaches, rocky coves and quaint villages. Day 2 ends with dinner and a celebration, then riders take chartered buses back to Bedford while their bicycles are transported there safely. After sharing the first two days of their route with the NEC 150, NEC 550 riders leave coastal Maine, heading west into the White Mountain region, where the challenge rolls north up the Kancamagus Highway to Lincoln, N.H. The journey continues through Kinsman Notch and crosses the Connecticut River into Vermont. After a night in Montpelier, riders pedal the river valleys of the Green Mountains on scenic Route 100 to the Killington area and the welcome comfort of a ski resort. The trek continues through Vermont and then back into the Monadnock region of New Hampshire with an overnight in Keene, N.H. The final leg heads to Central Massachusetts, winding its way to the finish at Middlesex Community College in Bedford, Mass., on Friday, July 19. The Gran Prix of Beverly is a criterium, or crit, a bike race held on a short course (usually less than 5 km), often run on closed-off city centre streets. Race length can be determined by a total time or a number of laps, in which case the number of remaining laps is calculated as the race progresses. Generally, the event's duration (commonly one hour) is shorter than that of a traditional road race — which can last many hours, sometimes over the course of several days or even weeks, as in a Grand Tour. However, the average speed and intensity are appreciably higher. The winner is the first rider to cross the finish line. Events often have prizes (called primes, pronounced "preems", and are usually cash) for winning specific intermediate laps (for instance, every 10th lap). A bell is usually rung to announce to the riders that whoever wins the next lap, wins the prime. Success in road criteriums requires a mix of good technical skills — in particular, the ability to corner smoothly, while "holding your line" on the road, as well as rapidly and sharply — and riding safely with a large group on a short circuit and exceptional "sprint" ability to attack other riders and repeatedly accelerate hard from corners. Put on by our friends at Essex County Velo, you can find more information on the official website. 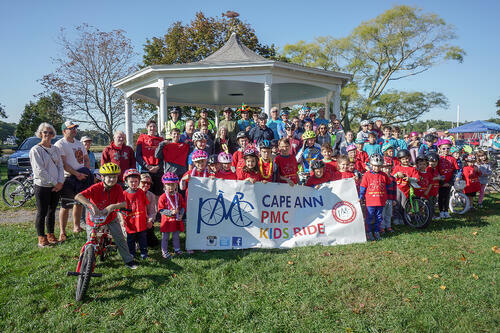 The Cape Ann Kids PMC Ride is the first on the North Shore. It began in 2014 after The Morris Family of Gloucester, MA. lost their beloved husband, father and grandfather Russell R. Morris of lung cancer on March 11, 2013. We lost Russell's brother, Billy Morris six weeks later, also to lung cancer. Russell's wife, Pat had planned on riding in the following year's adult Pan Mass Challenge. She succeeded in completing her first ride in 2014. However, Russell's granddaughter Alexis wanted to channel her emotions in a positive way after struggling greatly with the loss. She decided she was going to start her own kid's ride to help combat cancer in her own backyard. So, thanks to Alexis, her cousins Samantha and Braeden and countless family and beloved friends, our flagship event in 2014 raised over $6500.00. Our twelve riders and their families helped to empower our family and gave us a way to fight back against cancer. Fast forward to 2018 and this ride has raised over $39,000.00 for Dana-Farber. We are happy to provide a bike safety check station for this event! Enjoy spectacular scenery, on-road support, an dfinish line festivities at Greenbelt's 5th annual cycling event. Along the way, pass more than 50 properties conserved by Greenbelt, Essex County's Land Trust. Choose between the 50 or 25 mile road route or opt for the 40 mile gravel grinder. We enjoy providing mechanical assistance to the great event! 2016 Tour de Greenbelt from Essex County Greenbelt on Vimeo. For registration and more information, go here. All proceeds support Essex County Greenbelt Association. Take a dramatic harborfront park at the height of fall foliage season. Set up a twisting grass, dirt and asphalt racecourse with challenging obstacles. Unleash a crowd of world-class cyclists to charge through the sharp curves and jump the barriers. Add screaming, cowbell ringing fans incited by a dynamic announcer. What do you have? One of the premier bicycle races in the country, right here in Gloucester. The Gran Prix of Gloucester is two days of international caliber races where competitors from all over the US, Canada & Europe converge to race on the most beautiful race course in North America. We love supporting this great annual event hosted by our friends at Essex County Velo. Look for our booth in the vendor area and say hello! We like to have a reason to ride for every season of the year! We don't drop people on our shop rides. Our goal is simply to get out and enjoy our bikes and share the experience. If one of these doesn't fit your schedule, call or stop by the shop and talk with us! Chances are someone would be interested in going out with you. MONDAY ROAD RIDE - This is a nice, social-paced loop around the North Shore we where we average between 15-18 mph. THURSDAY TRAIL RIDE - A 6:15 PM cross-country ride from the shop. We go out and have some fun on our local trail network. COMING BACK AT THE END OF APRIL! FAMILY TRAIL RIDE - Do you have a kid or two that wants to get their mountain bike on the trails but aren't sure how to get them started? Or does your child ride at school and want to go out with you? We've got the perfect ride for you! We meet up at Gordon College and loop through their trails for about an hour. How technical the ride is will depend on participant ability and we are happy to give tips and instruction as we go. We will introduce this bi-weekly ride Sunday afternoons in April or May when the trails are back to ridable condition. WE HOPE TO BRING THIS BACK SOON! There is an amazing amount of public open space around us! One of the reasons we do is because of the efforts of some hard-working organizations that are dedicated to preserving and maintaining them. Each spring we invite some of them to come talk about what they do, how they do it and what they have planned for the upcoming year. Members from Cape Ann Trail Stewards, North Shore Nemba [a/k/aNew England Mountain Bike Association (NEMBA)], Essex County Trail Association (ECTA), Greenbelt - Essex County's Land Trust, Beverly Open Space and Recreation and North Shore Nordic Association will present their plans for protecting and improving our trails and what they have in store. You can find updates and more information on our Facebook event page. Come join us for some refreshments and be a part of our forum!